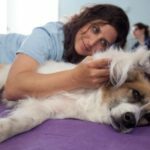 The mission at California Animal Rehabilitation is to use a gentle, integrative approach to lead the way in maximizing pets’ comfort through all life stages. Fueled by empathy, passion, and respect, the dedicated CARE team advocates for pets while educating our community. Our hearts are in it to win it! 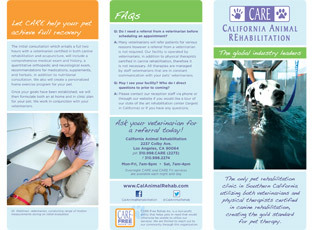 Does Your Pet Need Rehabilitation? From head to tail, CARE has services to meet your pet’s needs 24/7 and keep them strong, healthy and happy, even when you are at work or out of town. 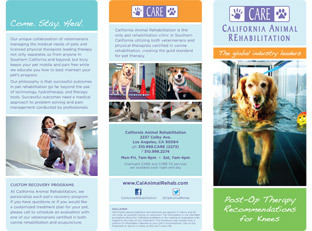 The only rehab clinic in Southern California utilizing veterinarians certified in both acupuncture and rehabilitation and physical therapists certified in rehabilitation, creating the gold standard for pet therapy and thus positioning CARE as the global industry leader. CARE veterinarians and physical therapists work with your pet in the comfort of your own home. 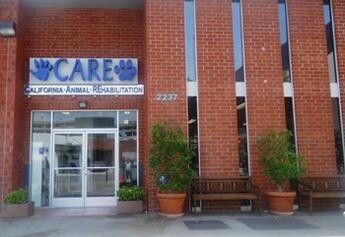 We extend Home CARE to dogs, cats, and horses, among other large animals. 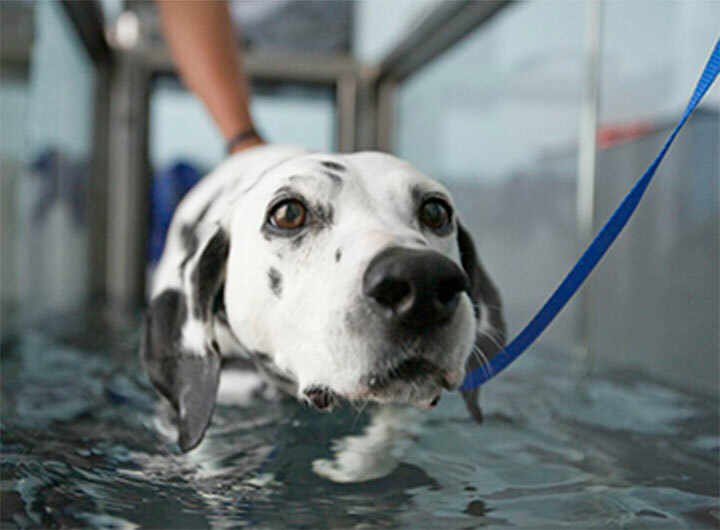 Personalized training sessions created by CARE veterinarians and physical therapists including therapeutic exercises, stretches, massages and pool swims. CARE Fit enables pets to get healthier and stronger while enjoying one on one attention in a safe, controlled environment without dog to dog interaction. Day CARE with veterinarians on-site and the option of adding CARE Fit sessions. Overnight CARE with skilled supervision and certified veterinarians on call 24/7. Professional, full-scale grooming services are also available, including haircuts. 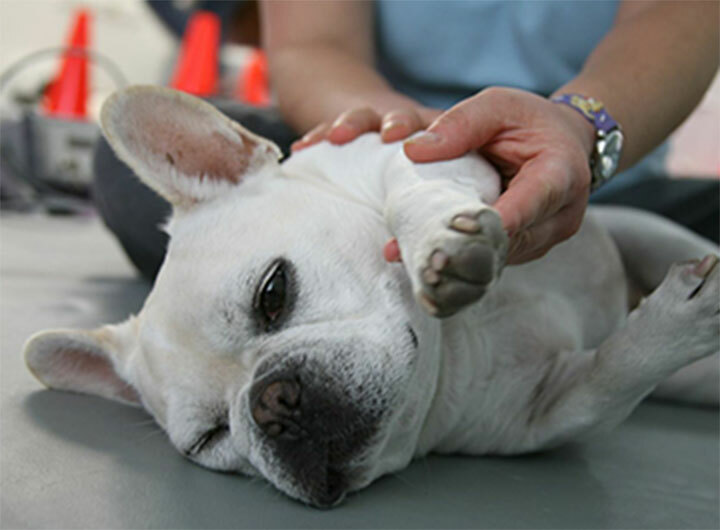 As the only facility in Los Angeles that pairs veterinarians certified in acupuncture and rehabilitation with Doctors of Physical Therapy certified in canine rehabilitation, California Animal Rehabilitation represents the gold standard in the field. The synergistic pairing of these two expert perspectives – along with the latest technology – produces the optimum outcome for all of our patients, from healthy fitness and agility dogs to arthritic senior cats. The journey wasn't easy, but Sammi the springer spaniel has learned to walk again. The 8-year-old dog had a bone growing near his spinal column that began to press on his spinal cord, according to a press release from California Animal Rehabilitation. Doctors operated, but were unable to remove the excess bone, leaving Sammi quadriplegic. But after months of intense rehabilitation treatments, Sammi learned to sit up, walk and eventually run.